An instant printable E-voucher will be emailed to you when you purchase a voucher which you can print at home and use straight away. A beautifully printed gift card will be posted first class within 1 working day. 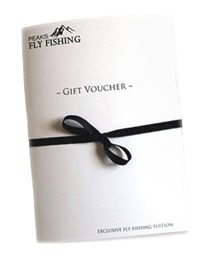 When buying a gift voucher, you do not need to book a date for the lesson, the recipient has 1 year in which to arrange a convenient date for the fly fishing lesson. Fantastic low coach to client ratio. Peaks Fly Fishing are one of the leading fly fishing schools in the UK. We provide high quality fly fishing lessons that are exhilarating and fun underpinned with the technical learning required to help people learn the art of fly fishing. Our game angling coaches, headed by David Johnson are all highly experienced, qualified & insured. We are committed to excellence and continued professional development and strive to deliver the most fun, engaging and educational fly fishing lessons in some of the most beautiful & exclusive locations in the UK. We are a UK Limited Company with years of experience delivering game angling coaching, as well as the manufacture and retail of fishing tackle and flies. Nestling on the edge of the Peak District in Derbyshire, just a few miles downstream of the Chatsworth House, our private beat of river Derwent near Darley Dale is available for all our clients to learn the art of river fly fishing. Get away from it all learning the art of wild fishing in the truly spectacular surroundings of the Upper Derwent Valley on Howden & Derwent reservoirs (approx 600 acres). We have exclusive access to coach on these waters. With no roads, shops or sometimes even people nearby the silence can be deafening, only interrupted by the occasional bird of prey whistling overhead or the distinctive call of the grouse on the moorland edges. Learn the art of fly fishing at one of the finest waters in the UK. Ladybower is set in the heart of breathtaking scenery of the Peak District near the villages of Hope and Hathersage. You will learn the techniques for catching the Rainbows and Wild Brown Trout that frequent this water. You can even take a rainbow trout for your tea if you catch one!